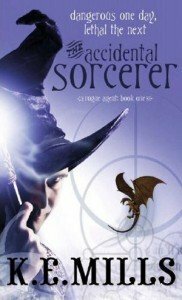 Finished reading The Accidental Sorcerer (Rogue Agent) by K.E. Mills. Gerald Dunwoody, a third grade wizard and safety inspector for Ottoslands Department of Thaumaturgy. Gerald career is thrown for a loop when he inadvertently blows up a wand factory while trying to prevent disaster. After being fired Gerald takes a job in New Ottosland, an almost bankrupt district, as royal court wizard for King Lional the 43rd. To prove his powers to King Lional and the king’s sister, Prime Minister Princess Melissande, Gerald turns a cat into a lion. With the Princess in danger, a talking bird who can’t stay out of trouble, and a war to prevent, Gerald soon suspects that he is in over his head. In The Accidental Sorcerer K.E. Mills pulls you into a fascinating fantasy world. The Accidental Sorcerer is the first book in the Rogue Agent trilogy. This book sucked me in. I’m looking forward finding out where Mills takes Gerald’s character.